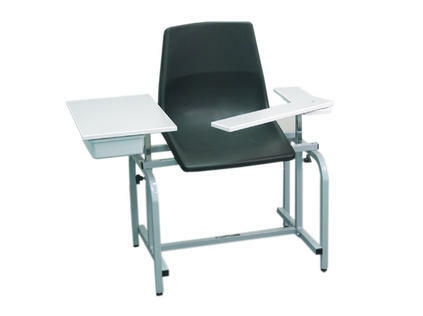 Injection Chair features an easy to clean, one piece plastic drawer. Drawer and arm can be mounted on either side of the chair. Designed specifically for injections and blood drawing, this chair is a comfortable solution for patient seating and positioning. The flat surface of the armrest prevents backbending of the elbow and subsequent flattening of the vein. The armrest is height adjustable to accommodate all patient sizes with a knob adjustable double pivot swing arm. The seat itself is one piece of plastic which makes it easy to clean. A stiffener bias limits backrest flexibility to ensure stable seating. Features an easy to clean plastic drawer.